A Scottish schoolboy international against England in 1910 he came to the United States in the same year and played for American Cup winner Tacony. A member of the great Bethlehem Steel team from 1913 until 1918, when his playing career was ended by a knee injury. 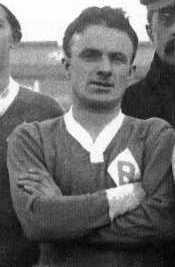 He starred on Bethlehem's National Challenge Cup winning teams of 1915 and 1916. Inducted into the National Soccer Hall of Fame in 1951. Bobby died in Bethlehem on June 4, 1952. His brother, Joe Morrison, also played for the Bethlehem Steel F. C. Bobby was married to Catherine Doherty and had one daughter, Eileen, who did not marry.